As a content management professional, no doubt you’ve been exposed to the process of creating and delivering content for your firm (or your client) to market and sell your (their) products and services. A primary use of your CMS is to act as a delivery channel for that content. Hopefully, that content is also used by all members of your firm, including your sales team, your service personnel, or other “customer-facing” employees within your business. The reality is that in most cases, that’s simply not the case. Numerous studies have shown that there is a very real gap between what firms produce as content for their marketing channels (e.g., website, social media, etc.) and what customer-facing employees communicate to customers in sales meetings, proposals, and even after a sale is made. In larger businesses, this has evolved from a broader organizational problem that can best be described as the War between Sales and Marketing. If you have worked in a Marketing or Sales department or for an agency that deals with customer Marketing organizations (including many CMSExpo attendees), you’ve likely been exposed to this conflict. Our consulting experience helping clients leverage content to increase revenue has shown that for many small to medium businesses, the Sales versus Marketing conflict isn’t strictly an organizational problem. Most of them don’t have separate sales and marketing departments; in fact, for most small firms, “sales and marketing” as a conflict can be better described as a war inside your head. You have to weigh how to spend your time and resources either on selling OR marketing because you are the only person you have to do both! 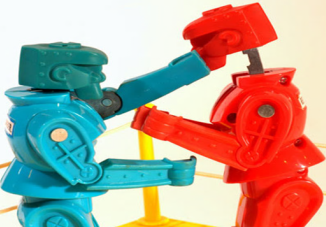 While sales versus marketing may involve people conflict, the source of the conflict is not a personality battle but a struggle (and/or competition) to acquire resources and time to produce messages that lead to selling something. Most of the time, even if you are a sales and marketing team of one person, you have to make choices about how you deploy your budget, time, and resources either to produce the content you use for marketing and selling, or to sell. Even large firms must figure out how to do this; they can just deploy more resources, personnel, and budget. Given the decision process to produce content versus selling, what is often missed is that marketing and sales messages should agree when communicated to prospects and customers. If your sales messages are not the same as your marketing messages, what does this say to prospects and customers about your business? Think of your potential customer spending their time using Google to research your firm’s products or services, and then meeting you, only to find out everything said on the website directly contradicted what you say in your meeting! The Net/Net: we need a way to design, produce and manage content that addresses the sales versus marketing conflict because if we don’t, we waste money, time, resources, and most likely, we lose customers and revenue. Our content describes who we are, what we sell, and most important, the value we deliver to customers with our products and/or services. This content will be used both in our marketing media channels and during sales calls to convince prospects and customers that they should buy our products and/or services. Finally, the biggest benefit may be the economies and efficiencies we can accomplish by having one focused, integrated content development and deployment strategy. Our CMSExpo presentation, Sales Versus Marketing: How to Stop the Battle & Start Getting More Customers, we’ll discuss the sales versus marketing conflict in detail, building on the Wednesday morning panel discussion, Content Marketing & Sales For Maximum ROI. We’ll introduce a go-to-market strategy for creating integrated sales and marketing content that can and should be deployed in all areas of your business. We’ll describe an organizational process and content creation methodology that firms of any size can use to define and deploy their content. Last, we’ll show you how this content can be enabled for your sales team so they stay on message in meetings with prospects and customers. These sales and marketing Best Practices will lead to better collaboration and higher revenue by creating an integrated bottom line. Everyone in the organization contributes, and our customers win.